This year Vassana (Rainy Retreat) Season will be from 29th July 2018 till 04th November 2018. You can sponsor a week during the three months in order to gain meritorious blessings. You are co-cordially invited to participate to the opening ceremony and reserve the day in advance for the final celebration. 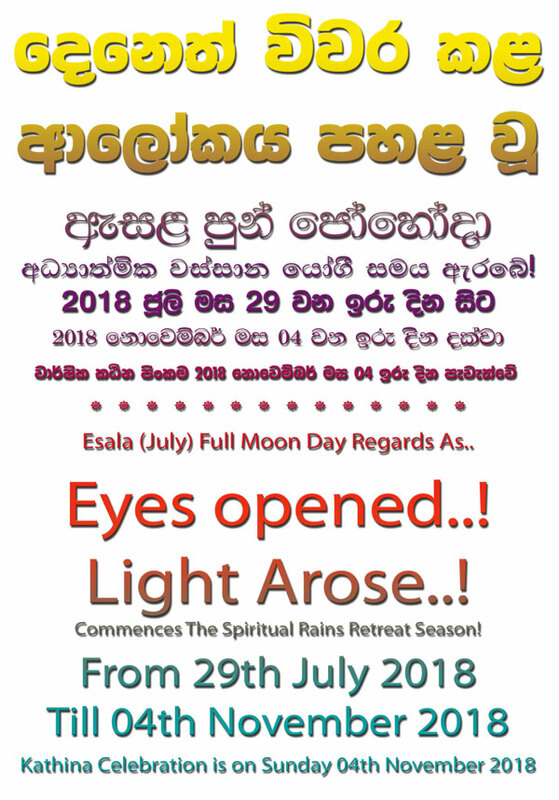 You are cordially invited to our Esala Full Moon Day Programme together with Invitation Ceremony to Annual Three Months Rains Retreat, held on Sunday 29th July 2018 from 9AM till 6.00PM. It has been a very busy time last few months at the centre with lots of building activities of a new meditation hall. We are very happy to share the new that "New Meditation Hall" is now finished and being used. This is really a wonderful thing as lots of our friends benefit from the beautiful and shrine hall to meditate. Much merits to all those who worked very hard to get it done. Buddhist Centre now turning out to be very beautiful. Do come around and see the difference. We share the blessings with all of our members! Therefore, we write this to invite you to come and join us at the ceremony to commence this year Annual Rains Retreat Three Months on Sunday 29th July 2018. 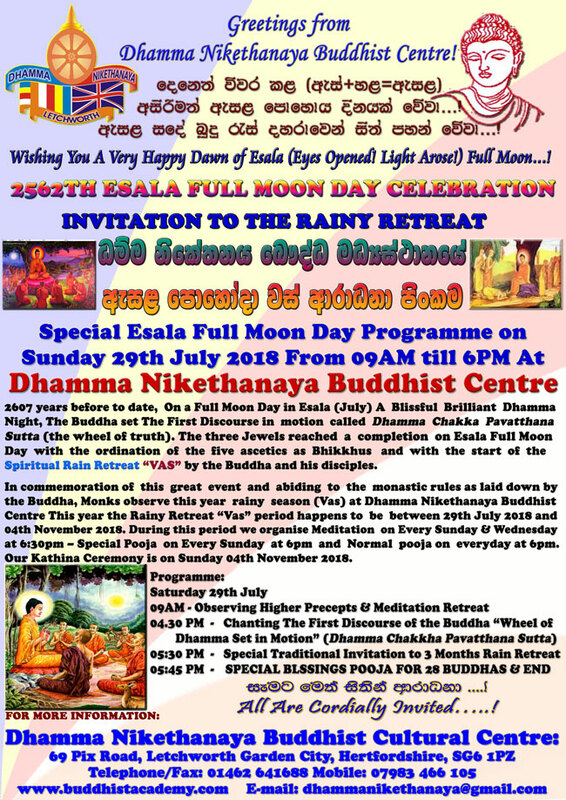 This day we observe the Esala (July) Full Moon Day and spend from 9AM till 6.30PM with Chanting of First Discourse, Dhamma Talks, Meditation and Blessings. This day we start the programme with chanting the first sermon of the Lord Buddha, Dhamma chakka pavaththana Sutta (wheel of Dhamma Set in Motion). Then we invite the monks to observe three months retreat at Dhamma Nikethanaya. This is a highly blessed and an auspicious occasion, we encourage to keep the day free to join us and share the blessings! We invite all our friends and devotees of Letchworth Dhamma Nikethanaya Buddhist Cultural Centre to attend the special occasion of inviting venerable monks to the 2018 Spiritual Rains Retreat Season on Sunday 29th July 2018 at 4.30PM. This formal invitation is an essential customary obligation of the friends and devotees of the centre. Esala (July) Full Moon Day has many traditional significances. The three Jewels reached a completion on Esala (July) Full Moon Day with the ordination of the five ascetics as Bhikkhus and with the start of the Rainy Retreat “VAS” by the Buddha and his disciples. In commemoration of this great event and abiding to the monastic rules as laid down by the Buddha, the monks residing at Letchworth Dhamma Nikethanaya are observing their Rainy Retreat “Vas” for the twelfth consecutive year. This special religious ceremony for INVITATION to commence Three Months Spiritual Rains Season will be held on Sunday 29th July 2018 and we are cordially invite you to participate in this meritorious activity. During this season both monks and lay devotees engage in extra Dana (Charity), Sila (Morality) and Bhavana (Meditation). Hence this period is regarded as the highest sacred in the Buddhist Calendar. At the end, to commemorate the success and achievements of the retreat, devotees host Sangha Day Gratitude Kathina Ceremony which will be held on Sunday 04th November 2018. We kindly remind you to keep this date free for this special meritorious ceremony which can be held only once a year in any temple and share the merits of this. This year the Rainy Retreat “Vas” period happens to be between 29th July 2018 and 04th November 2018. 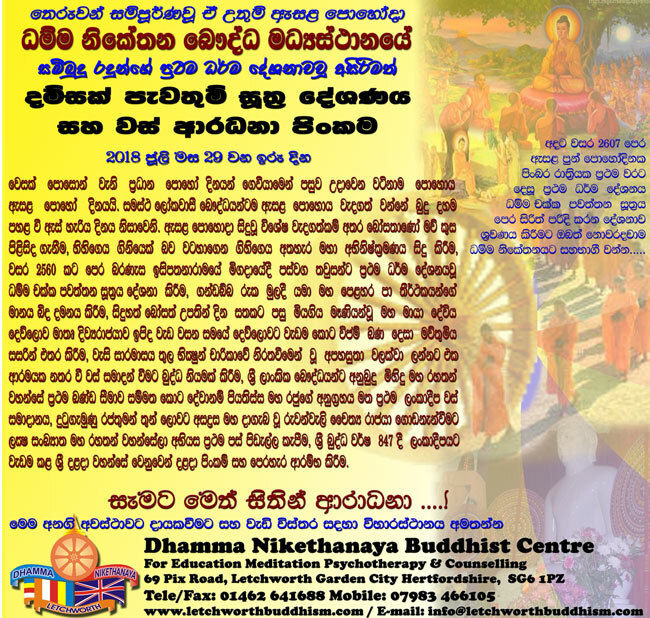 During this period we are organising a series of Weekly Dhamma Sermons, Bodhi poojas and meditation on Every Saturday Evening for the benefit of devotees and to make them understand to attend to the needs of the Buddhist monks during the rainy season. You can sponsor one week during this season. It is indeed in great help if you can sponsor one of these events during this periods to make the retreat success. One individual can sponsor the event by taking the main responsibility. However it has to be done with the full participation of all the members (dayaka) of the centre. This year 2018, principal sponsorship is granted to Mr Santok & Mrs Usha Saroye and family. 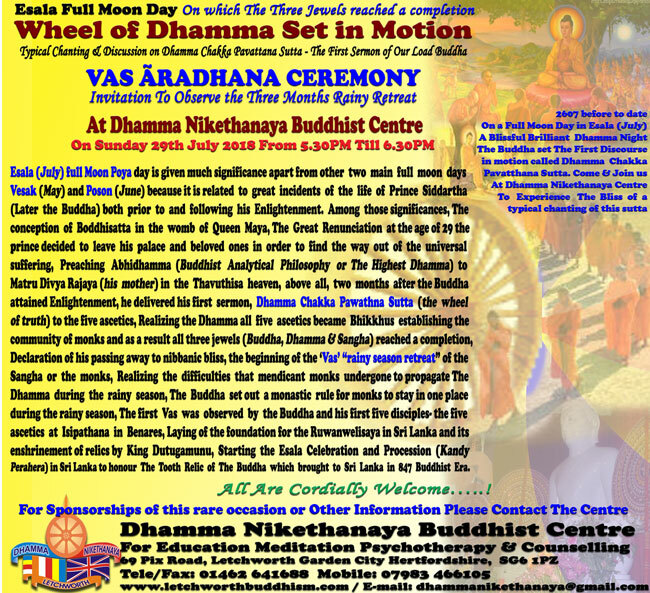 We also conduct a Special Ceremony on this Full Moon Day July (Esala) Sunday 29th from 9AM till 6.30PM. We kindly invite you to take part in this programme. If you wish to support by any other means to the day programme, please contact the centre. 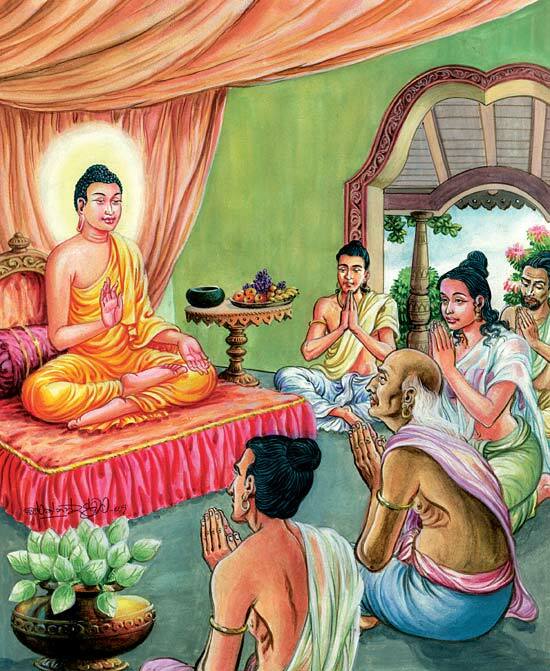 Esala (July) full Moon Poya day is given much significance apart from other two main full moon days Vesak (May) and Poson (June) because it is related to great incidents of the life of Prince Siddartha (Later the Buddha) both prior to and following his Enlightenment. Among those significances, The conception of Boddhisatta in the womb of Queen Maya, The Great Renunciation at the age of 29 the prince decided to leave his palace and beloved ones in order to find the way out of the universal suffering, Preaching Abhidhamma (Buddhist Analytical Philosophy or The Highest Dhamma) to Matru Divya Rajaya (his mother) in the Thavuthisa heaven, above all, two months after the Buddha attained Enlightenment, he delivered his first sermon, Dhamma Chakka Pawathna Sutta (the wheel of truth) to the five ascetics, Realizing the Dhamma all five ascetics became Bhikkhus establishing the community of monks and as a result all three jewels (Buddha, Dhamma & Sangha) reached a completion, Declaration of his passing away to nibbanic bliss, the beginning of the ‘Vas’ “rainy season retreat” of the Sangha or the monks, Realizing the difficulties that mendicant monks undergone to propagate The Dhamma during the rainy season, The Buddha set out a monastic rule for monks to stay in one place during the rainy season, The first Vas was observed by the Buddha and his first five disciples- the five ascetics at Isipathana in Benares, Laying of the foundation for the Ruwanwelisaya in Sri Lanka and its enshrinement of relics by King Dutugamunu, Starting the Esala Celebration and Procession (Kandy Perahera) in Sri Lanka to honour The Tooth Relic of The Buddha which brought to Sri Lanka in 847 Buddhist Era.